Georgie Ferrari is Chief Executive of the Wellington Community Trust. Before that she Chief Executive Officer for the Youth Affairs Council of Victoria for 14 years and before that a variety of roles in the not for profit sector in Australia and New Zealand. But before all that, she grew up in Dunedin. Home for a brief visit we talked about making a difference through advocacy. I didn’t want to use my labour to turn a profit for someone else. To use my power for good, not evil. 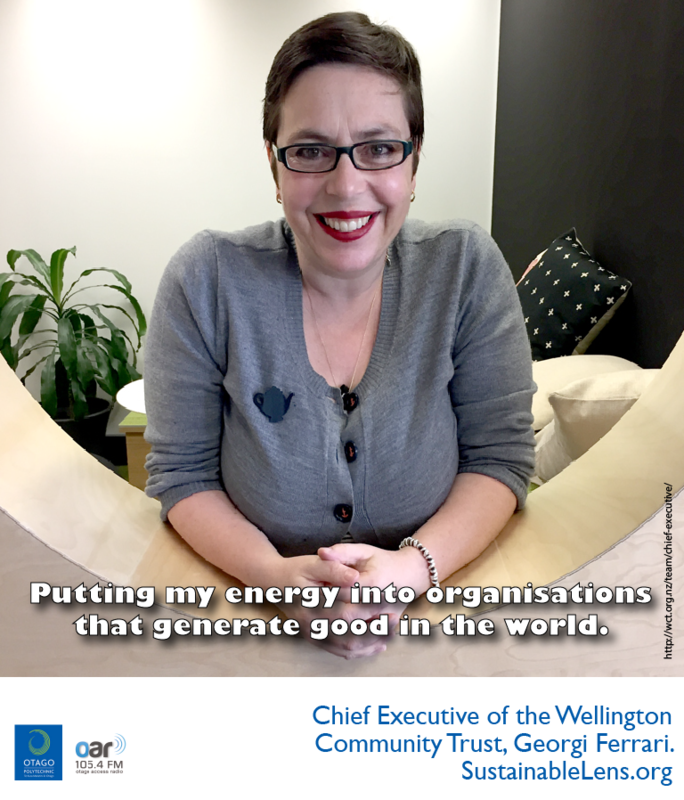 So that meant working in the not for profit sector – putting my energy into organisations that generated good in the world rather than money. I’ve been true to that. I’ve been driven by that. It’s easy to live in a bubble in activism world, we assume that all voices are heard. And so we live in that bubble…an echo chamber, it’s important to remember that there’s a range of views out there. We have to read conservative newspapers and engage in the conservative debate, otherwise we forget that a huge percentage of the population think like this. And then we don’t understand what their arguments are or what their mindsets are and we can’t fight against them. I’m not spouting some leftie Communist manifesto, I’m just making some pretty basic sense, if a child is traumatised in their lives…no one is looking after them, them trauma plays out, then we lock them up. that’s not working, I think that’s common sense. If even a deeply conservative politician can go and spend a couple of hours at a youth justice facility and come out and see that, then we can change every heart and mind. Energised by work I was doing. Ethical investment: If we give money out in the environment space, but we’re invested in a company that’s degrading the Great Barrier Reef…I’m not interested in doing a little bit of renewal in a creek bed if over here we’re funding a corporation millions of dollars to degrade the Great Barrier Reef – it doesn’t make sense. Or funding refugees and government bonds of governments creating those refugees – it doesn’t make sense. And ethical investments strategies are doing no worse over the long term than broader investment strategies, so the argument is going away. We have to know that we’re not feeding the problem over here and trying to ameliorate it over here. Sustainable: Living gently on the earth. Success: Growing an organisation in Victoria that it is not only financially stable and productive, but also deeply harmonious and gentle and supportive of all the staff. Superpower: Collaborative leadership. I’m not afraid to make decisions, but I’m very keen to engage everyone involved. Kind corporate. Efficient and effective, but care about each other. We do need training in that. Activist: Yes. (in my new job I have to manage that a bit differently) there are causes to champion, how I need to be an activist is to be provide evidence that these are things we need to fund. Back room diplomacy rather than in your face advocacy. Motivation: Knowing that there is far more good done in the world than bad, and wanting to contribute to that good. Challenges: Reintegrating back into New Zealand that’s different to what I left. My responsibility as a Pakeha woman. Philanthropy across New Zealand can be more effective by working smarter and together to make it easier for our grant seekers. Miracle: Elimination of all forms of violence. (smallest thing that would make a difference) Live peacefully ourselves. Advice: Be kind to your mother. Ring your Mum.